Entering Saint Augustine and Suds, you first notice waves of heavenly scents. With a cozy cabin feel that mimics the mountainous area owner Denise Debo grew up in, the shop is a delight to the senses. The new artisan soap shop will allow fans of quality soaps and soaks to stock up on favorite products without waiting for summertime festivals. In her shop, opened up on September 1, Debo sells quality, handmade, ethically created soaps, bulk medicinal herbs, shave creams, beard sprays, body soaps, bath soaks, and facial bars. She also offers vegan options and custom orders. Saint Augustine began as Debo’s “mom project” for relatives during holidays. She also developed some of the products for her son after he was born. With a background working for wholistic companies, she took her existing knowledge and learned a bit more to open the shop. From the various essential oils to the herbs, everything is sourced and created ethically and without animal testing. This business is really a labor of love, and it shows from the moment you step through the door, and even moreso when Debo explains the origin of the name. The shop is named after Debo’s son, who is just as friendly and sweet to talk to as his mom. “Augustine is who the shop’s named after. It’s all for him.” That is literally true of largest area in the store, a back room furnished for Augustine to learn and play in when he is out of preschool. Coming up in October, Denise is teaming up with her neighbor at Niko’s Sandwich Shop to operate a pop-up market taking over the patio. The event on October 22 from 12 – 4 pm will feature a number of different vendors and pumpkins for last-minute Halloween shoppers. 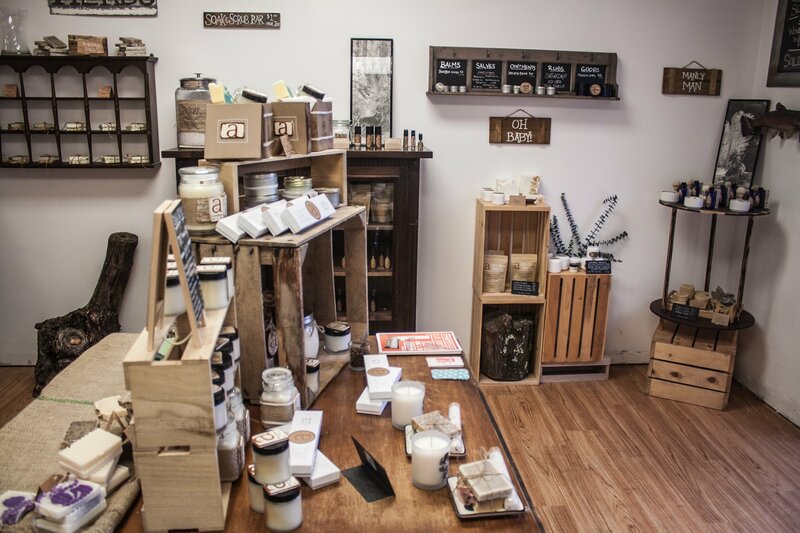 Saint Augustine and Suds offers products for fans of handcrafted soaps, consumers concerned about chemicals and unethically sourced ingredients and fans of Akron’s independent small businesses. The shop, located at 1947 West Market St. Suite 102, is tucked behind One of A Kind Pets on West Market St., just past the railroad tracks.